It is with pride that the Royal Rosarians participate in festivals in cities throughout the Pacific Northwest as Ambassadors of Goodwill for the City of Roses, Portland, Oregon. The Royal Rosarians are part of the Northwest Festival Hosting Group (NWFHG), an organization formed in 1981 with the Royal Rosarians being one of the original eight members. The purpose of the NWFHG is to promote member festivals, share resources between members and to enhance the quality and attendance of each member's event. The festivals are located within British Columbia, Idaho, Oregon and Washington. Each festival must have a parade and a weekend hosting packet. The following articles cover each of the current member festivals in chronological order. Click on the links to the left for the dates and details of each festival's hospitality weekend. The Washington State Apple Blossom Festival takes place end of April/beginning of May. It was originally called "Blossom Day" and was founded as a one-day event in 1919 to celebrate the importance of the apple industry in the region. Following World War II, the festival was renamed to the Washington State Apple Blossom Festival to more accurately reflect the apple industry in North Central Washington. Started in 1938 by the Associated Garden Clubs and Spokane Floral Society to showcase the area's beautiful spring flowers, the festival is now a week of festivities in mid May combining the city's famous lilacs with events that culminate in the nation's largest Armed Forces Torchlight Parade. The festival takes place the third weekend in May and the mission statement is "Honoring Our Military, Empowering Our Youth, and Showcasing Our Region". Since 1971, the Hyack Festival Association has organized a wide range of events to help preserve the history and traditions of New Westminster. The city was selected as the first capital of the new colony British Columbia and was officially named by Queen Victoria after her favorite part in London. This is why the city is known, even to this day, as the Royal City. The word HYACK is from the Chinook Indian dialect meaning swift, quick or hurry up. In 1861 the volunteer fire department was given the name Hyack Company #1, a swift group that would hurry up when called into action. The Hyack Festival Association took the name as remembrance to the group and their historic significance in the city. The festival has been in existence since 1932 and grows bigger every year just like the city itself, which is one of the fastest-growing cities in Washington state. Originally a timber town, agriculture began to grow, with its fertile land especially suited for strawberries. By 1920, the city had more than 2,000 acres of strawberry fields, leading to the city's nickname "Strawberry City" and the establishment of the annual Strawberry Festival, which is held in mid-June. One of the highlights of the festival is the Strawberry Shortcake Eating Contest followed by the Twilight Grand Parade. In Mid-July the Capitalarians invite us join them in the celebration of their Capital Lakefair Festival in their State Capital. The festival was established in 1957 and has evolved into what it is today, a five day celebration of community spirit along the shoreline of Capitol Lake. The Capitalarians host a weekend of fun and camaraderie which includes a President's Dinner and their famous Clam Bake. The Seafair has been celebrated in the Emerald City since 1950 and spans over several weeks. Hospitality weekend is hosted by the Seattle Seafair Commodores, the Goodwill Ambassadors of the festival. The Shrimp Boat ride and the Torchlight Parade are only a few of the fun events featured. The Royal Rosarian Rose Planting takes place right under the famous Seattle Space Needle. The Penticton Peach Festival in August is the newest member of the Northwest Festival Hosting Group but has quickly developed into a popular destination for festival fun. Located between Lake Okanagan and Skaha Lake it has one of the most attractive climate of all Canadian cities. Lots of sun, little rain! Not only is this a perfect climate for peaches, other fruits and vegetables, the area has also become a premier wine country. The Hospitality packet offers a wine tour, craft beer tour or a relaxing float ride between the two lakes. 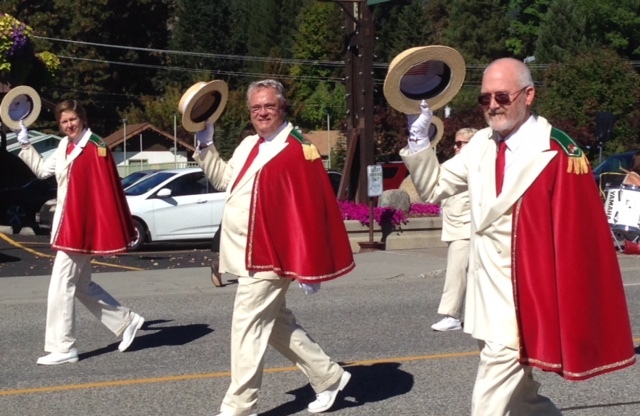 Peter Brothers Grand Parade is watched by enthusiastic and cheering crowds along the way and free entertainment is offered every night at Okanagan Lake Park right adjacent to the host hotel. The festival is Leavenworth's longest running event, originating in 1964 when the City of Leavenworth adopted the Bavarian theme. This picturesque Bavarian city has become one of the most popular tourist destinations in the Pacific Northwest. The Royal Bavarians is the hosting organization for the festival which takes place in late September. Pack your Dirndls and Lederhosen for the dinner on Saturday. Start of each morning with an Alphorn serenade from the balcony at the Enzian Hotel. The weekend is packed with fun events but there is plenty of time to do a little early Christmas shopping or enjoy a Bratwurst or Schnitzel at one of the local restaurants.